Have I ever found anything that I didn’t care for at Trader Joe’s? Yes, yes I have. I was not a fan of the Creamed Honey or the Flattened Bananas. I think those are the only 2 things. Great thing about Trader Joe’s is that if you buy something & you don’t like it, take it back & they will give you a store credit towards your next purchase. Can’t argue with that. 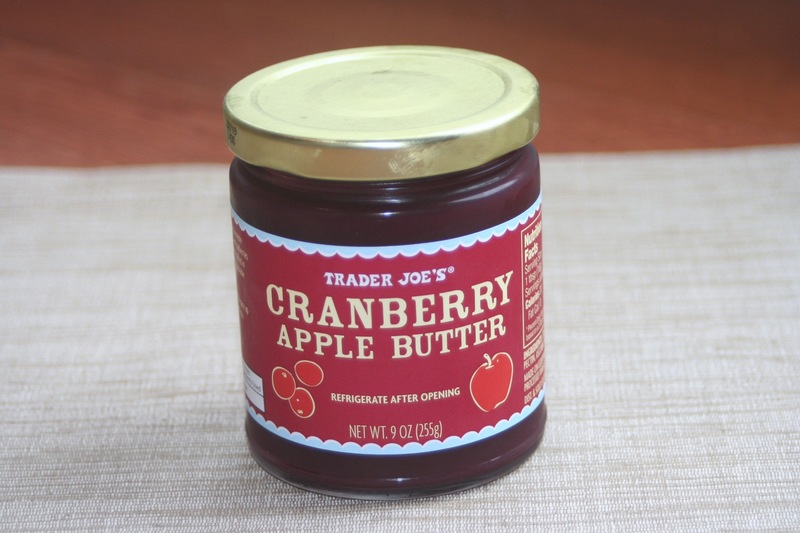 Enough about not liking things – onto my new found love: Trader Joe’s Cranberry Apple Butter. So, how did I use this new spread? 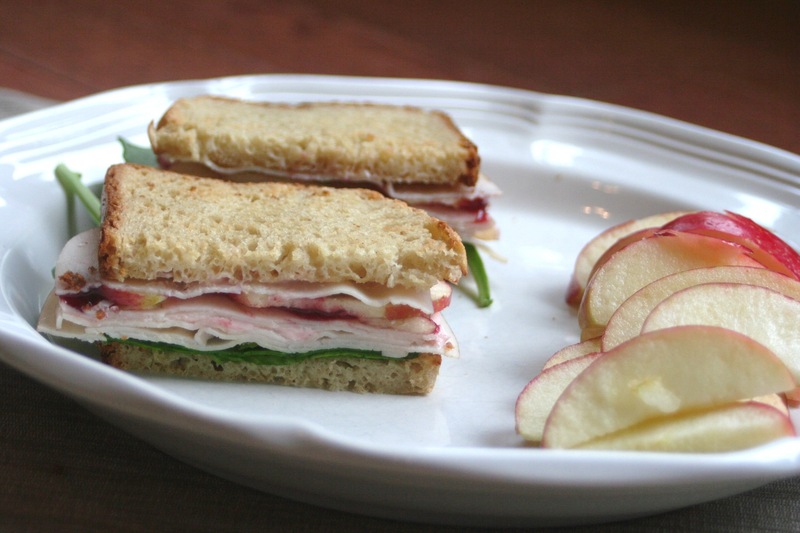 I eat a lot of sandwiches for lunch and have grown bored with my turkey/chicken, cheese, sriracha & spinach so I tried out a new combo – roast chicken, strawberry cream cheese, cranberry apple butter, sliced Honeycrisp apple and spinach on toasted Pamela’s Gluten-free Bread. What an awesome combination this turned out to be. I love the crunch that the sliced apple added to the sandwich and the cranberry apple butter added a nice tart bite to it as well. Great fall treat! Make sure to check out my newest Examiner articles: Gluten-free Italian Cookbook, Cranberry Sauce & Cranberry Glazed Carrots. Don’t forget to enter to win the Yoplait Kids prize pack! 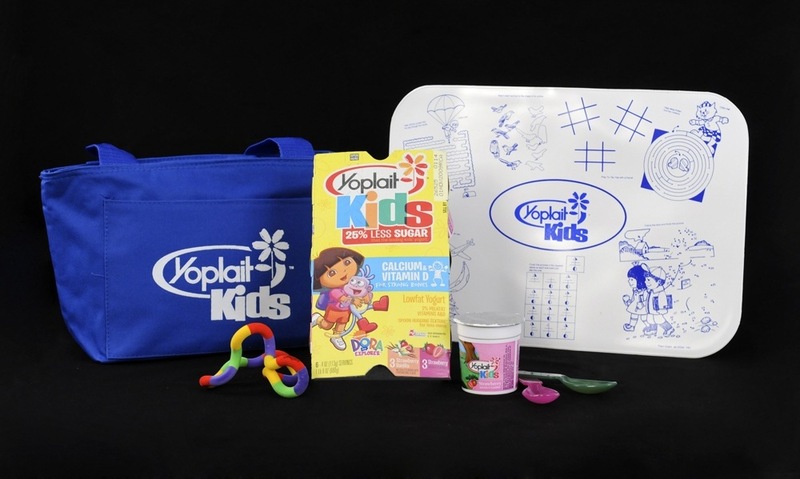 I have partnered up with MyBlogSpark & Yoplait Kids to give away 2 fun packs! MyBlogSpark & Yoplait Kids Less Sugar have come together to offer this great prize package for 2 of my readers! Yoplait is the yogurt that I buy for Jon because not only does Yoplait call out any gluten on their labels, but they have started to label their products “gluten-free”. Yoplait Kids has always been my daughter’s yogurt of choice….she hates chunks & pieces of fruit in her yogurt & Yoplait Kids is smooth & creamy & free of chunks. So, this is a favorite in our house. Are you searching for a snack for the kids that tastes good and is good for them? Yoplait Kids yogurt is the perfect solution with 25% less sugar than the leading kids’ yogurt. With its thick and creamy texture that will hug your little one’s spoon, you won’t have to worry about a sticky mess to clean up afterwards. It also contains no artificial sweeteners or flavors, so you can feel good about serving it to your kids. In addition, Yoplait Kids is a good source of vitamin D and, according to two new studies that provide the first national assessment of the crucial nutrient in young Americans, millions of U.S. children have disturbingly low vitamin D levels, possibly increasing their risk for a variety of health concerns, including bone problems. About 7.6 million children, adolescents, and young adults have vitamin D levels so low they could be considered deficient. It can be challenging for growing kids to get enough vitamin D because this nutrient is only found naturally in very few foods; however Yoplait Kids makes it a little easier to incorporate a delicious source of vitamin D and calcium in your child’s diet. If you are interested in entering this giveaway, please leave a comment below. If you have blog, you can receive an extra entry by linking back. If you have a Twitter account, you can receive an extra entry by tweeting & including @kbouldin in the tweet so I know. The deadline to enter is Friday at midnight. The 2 winners will be chosen Saturday morning. Good luck!